Despite the annoying harassment and veiled threats we received in Shanghai, we will continue to work on compiling the China School Whitelist for the benefit of new teachers arriving in China. Those of you already working in China for a year or two can clue in your newbie friends. Our goal is to have the list compiled and posted by the end of 2013 first quarter and made available free to members and new arrivals who come to our free monthly indoctrination and free cross-cultural seminar. As most of you know, we are not quick to blacklist a school since many negative reports we receive are either from disgruntled employees who were rightfully terminated (for substance abuse, or punctuality issues mostly) or from competitors trying to smear one another. We verify our reports and if 3-5 reports are received about the same school by real verifiable foreign teachers (past or present) it is safe to assume that where there is smoke there is fire. 1) At least five past or present foreign teachers must endorse the school with an email than contains their current resumes and photos. After we confirm their employment at that school for at least six months we will whitelist the school for one year. If however 3 or more verifiable complaints are received within any six month period, they will move to the Graylist until the complaints are resolved. Schools earn their place on the Whitelist by paying their teachers in full and on time and honoring their contracts without fail. 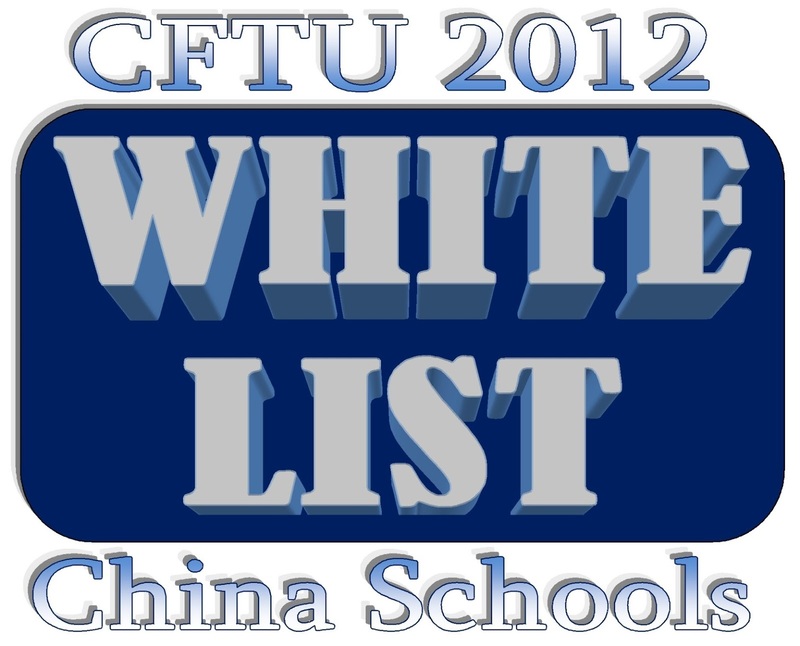 If schools make no efforts to resolve formal complaints received by the CFTU they will be banned from the whitelist for a year. Within a year's time we will have accumulated a database of the best schools to work for in China. Where is the link for the full school white list? How do you actually view the white list? How do you actually see the list? Did you make it so only current teachers can see it? How does that help anyone thinking of coming to China? What if I just found this page and already signed my contracts, sent my passport, already received my work visa, and letter of invitation? I also couldn't find the school on the blacklist.